I am re-posting this recipe as I didn’t like the previous photo. Suz has taken another photo. It was featured in an earlier post. (Otak Otak old pix). Mix all the curry mix together then stir in the kaffir leaves, coconut milk, eggs and sliced fish. In Malaysia where we have banana leaves and betel leaves in abundance, we take the opportunity to wrap up like a small parcel which resembles a ‘hand bag’. The other easier way of cooking the otak otak is to pour the curry mix into a 2 to 3 inch deep flat casserole with the sliced fish and steam it for 20 minutes. Lovely! Fantastic! Ho Chek! Made it yesterday for New Year’s Eve pot luck party and compliments were over flowing! I am living in Singapore, and the vendors seem to be ignorant of the ‘Betel Leaves’. In Penang, my mum called it “sn’ua lau hioh”. I bought the leaves from the market here and they gave me the ones people used for chewing with betel nuts instead! My otah turned out a disaster. Is there a malay word for the betel leaves? Hi Keith… in Malay it is called “Daun Gado”. correct me if I’m wrong. Hope that helps. The ‘Sua Lau Hiok’ is known in Malay as Daun Kadok. Kadok is confused with Betel Leaves aka Daun Sireh. Daun Kadok is more fragrant than Daun Sireh. Keith, kaduk leaves or wild pepper leaves are abundant in singapore but not sold at any markets because they are relatively ‘unknown’ in singapore. However, they are grown by National Parks Board at Changi Airport, East Coast Park and several other public places. Go take a look and pluck a few leaves. I don’t think NPB would mind. I have two pots of Kaduk plants for my otah. Seek and you shall find! Cheers! what is blue ginger and where can i find it ? Thanks for sharing these lovely recipes. What kind of fish would you suggest to use for this recipe? mdm kwong, thanks so much for sharing your experience and recipes!! your photos are wonderful too ! to other type of fish. Dear Madam Kwong, thanks for sharing the recipe. 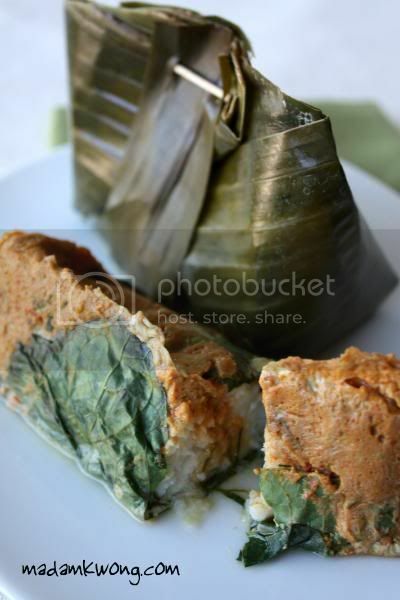 What fish do you recommend that I use to make otak otak? Thank you. Thanks for prompt reply. There’s only frozen dory fish available and they kinda have a teeny weeny bit of ‘fishy’ smell. If I wanna use fresh fish, what type would you recommend? I’d prefer fish with as less bones as possible Thank you,. Hi! I have all the ingredients almost except shrimp paste…what is it in Malay? Thanks for clearing the air on betel leaves, i was also a little curious if it was daun kadok or some people say kodok which i will try to hunt down around the neighbourhood along with banana leaves. Hope some good samaritans will spare me some without much fuss. I am a novice when it comes to fishes so dory suits me fine…all cleaned and ready to use from the supermarket. Shall explore this site for more devilishous recipes. Yummy! Can’t wait to try this first! I ate your otak2 for the first time and fell in love with it! :). Can you please teach me on how to wrap or form a parcel for the otak2 using the banana leaves? and another thing how many parcels can be made with the recipe above? If i want to make a big batch do i just double or triple the ingredients? Hi Madhu, gladly to but will have to take photos of the steps. As for the recipe, if you like to make a big batch double up the ingredients. Good luck! I am living in Auckland, New Zealand now. Does anyone know whether I can get Betel leaves here and what would it be called in Mandarin as there are some Asian supermarkets I can check with. If not can I substitute it for some other leafy veg?